I’ve told this story before on the blog but let me repeat it one more time. When I was a little girl there was this restaurant called Shoney’s by our house and when we would drive by it my Grandmother would always say ‘Shoney’s, it’s not that bad”. We would all laugh because why would you want to go to a restaurant that ‘is not that bad’ when you can go some place good. Every once in a while I will find a movie like that and I call it a Shoney movie. It’s not that bad but it’s not really good and since you have so many options why see a not that bad movie when you can see a good one? 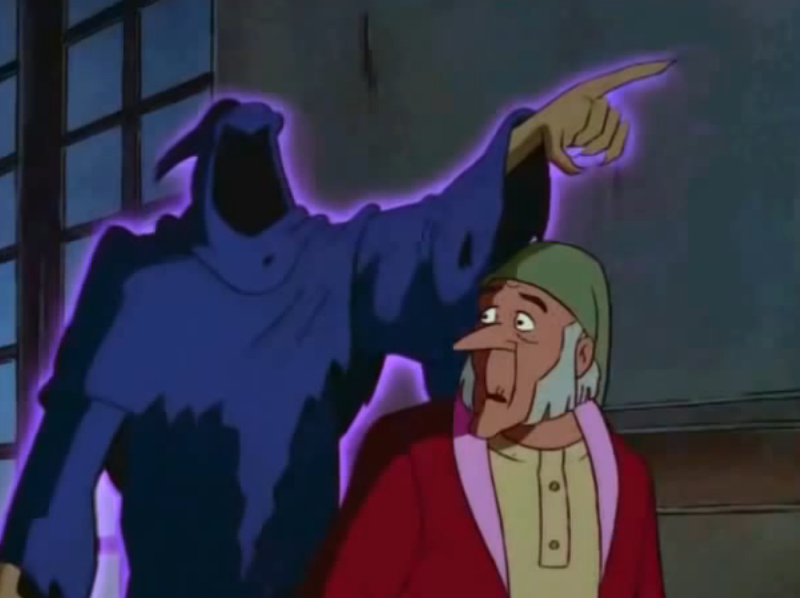 So is the case with 1997 animated version of A Christmas Carol. I know many hate it but I think it is a Shoney movie. It’s certainly not good but on the other hand I didn’t think it was that bad either. 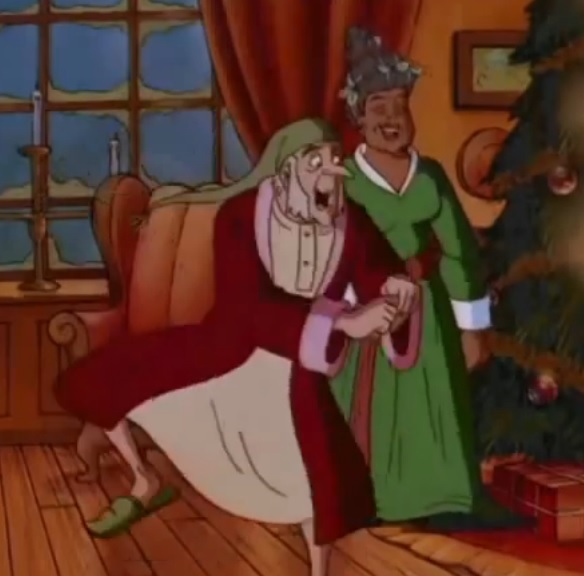 What makes it passable for me is Tim Curry as Scrooge. He is one of my favorite actors who is not in near enough movies. 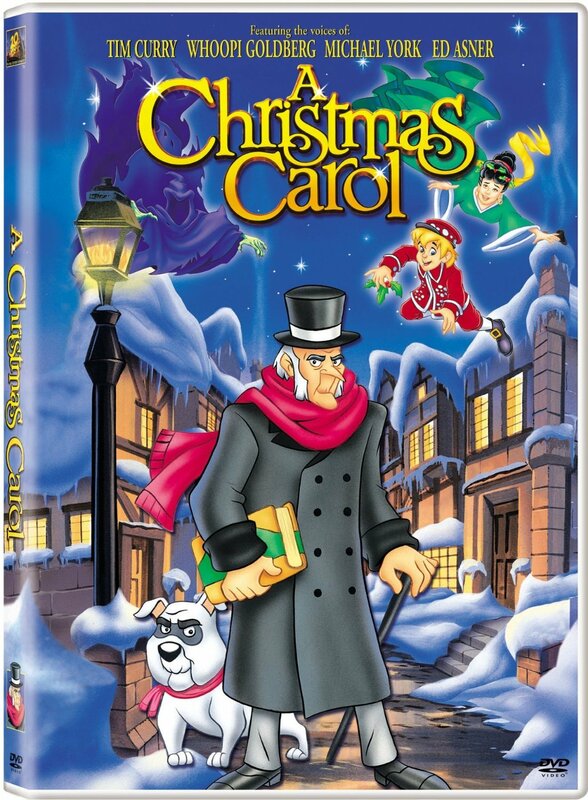 He has made playing a Scrooge a bit of a passion over his career and if you are an audible member you can download a recording of him reading Christmas Carol free which is infinitely more entertaining than this movie. It’s a shame really because he is so good he deserved better than to be saddled with a Shoney version in the movies. He even did a performance in 2001 at Madison Square Garden, which I’ve heard was amazing. Here he is singing from that production. This is particularly touching when you realize he sang it just 2 months after 9/11. Amazing they even did the parade that year. He’s still my favorite Long John Silver in Muppet Treasure Island (also my favorite Treasure Island). He chews up every scene he is in. I wish this version had allowed him to bring a 1/10th the charm and swagger he brought to Silver. But let’s talk about what it is, not what it could have been. 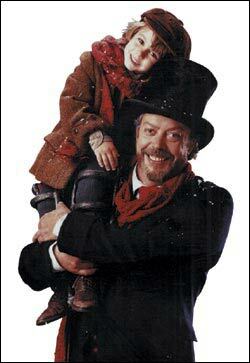 Scrooge- Again, I love Tim Curry, and I think he is fine in this. Certainly the faults of the movie are not in his voice performance, which has gusto and nuance. He also has a good singing voice where required. Differences- It is a pretty straight forward retelling with a few differences- most of them not really working. 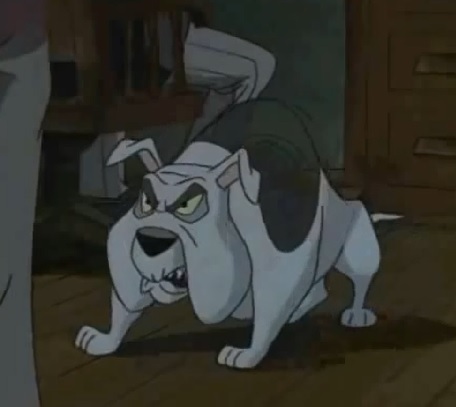 First of all, Scrooge has a dog which is very distracting. We don’t want to see the expressions of the dog. We want to see Scrooge. I guess I am just not an animal person, so I did not need the dog. Scrooge is enough. We do not need a mean dog to add to his meanness. The songs I actually think are fine but two are totally unnecessary. 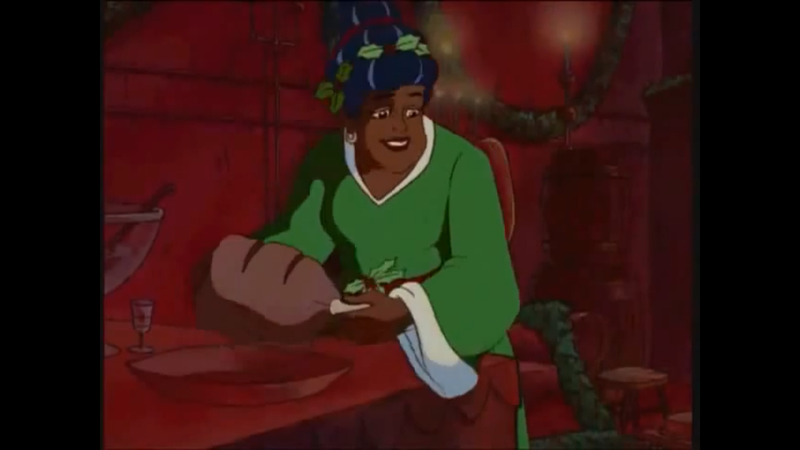 One called Random Acts of Kindness is sufficiently random sung by the woman who is bringing Scrooge dinner before he gets to his door. This just lengthens the time it takes for the story to really get going and isn’t sung by anyone important or pertinent to the story. Another strange choice is at Fred’s party they sing a song called Santa’s Sooty Suit and supposedly it was sister Fan’s favorite song. This seems like an incredibly silly song to be your favorite song and again isn’t necessary. One interesting difference is it is the only Victorian version I am aware of to have an African American ghost with Whoopi Goldberg voicing Present; although, it does not sound anything like her. Strengths- Even though I just criticized 2 songs the rest of the songs were pretty engaging and all are well sung. My favorite is Song on the Bridge with the voice of Ariel, Jodi Benson as Belle. 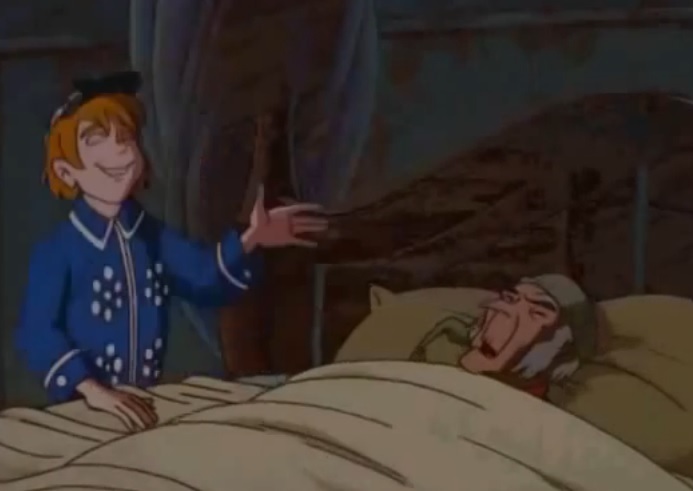 The whole Belle/Scrooge scene is done very well. Also I liked when Scrooge is looking at the Cratchit’s he says ‘I wish I had a family’ and Present says ‘But you do you silly man’. As a single adult sometimes it is easy to forget that we all have family even if it isn’t our own progeny. The voicecast is also across the board better than the movie deserves. Ed Asner as Marley, Michael York as Cratchit etc. Weaknesses- The animation is definitely the weakness. It is on the Saturday morning/direct to DVD level. It’s jerky in spots, it doesn’t match up with the vocals sometimes and it just doesn’t look that pleasant. Like look at Future. It looks like a cheap He-man villain. 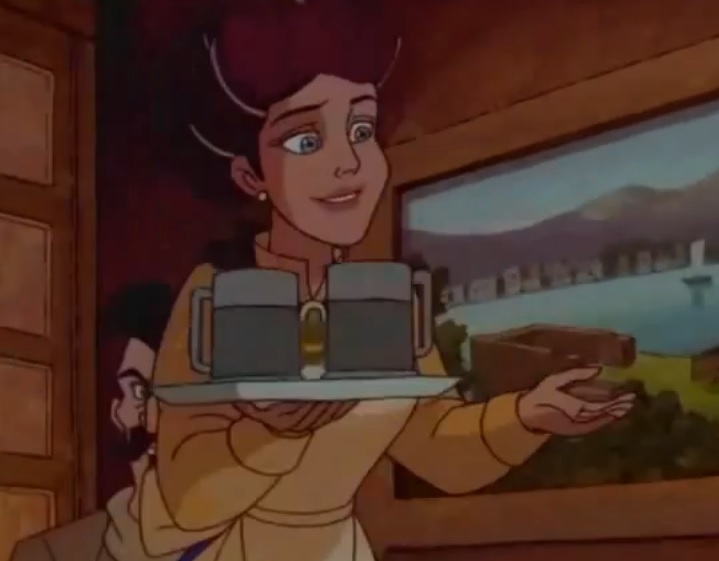 So if you can handle that kind of Saturday morning, cheap animation than the movie is much more tolerable. I just love Tim Curry so much that this version gets a Shoney vote from me. It’s not that bad and the music, and strong voices make it tolerable. I would certainly recommend the 2009 Disney version over this but that’s just my preference. This is a good one if you do not like the scarier elements as those are very tame. A few of the songs are decent and the voicecast is very good. So take it for what you will. If you feel like something that is ‘not that bad’ than go for it. I would say watch a great version instead of good but it’s passable. (Glowing endorsement I know but I call it like I see it!). 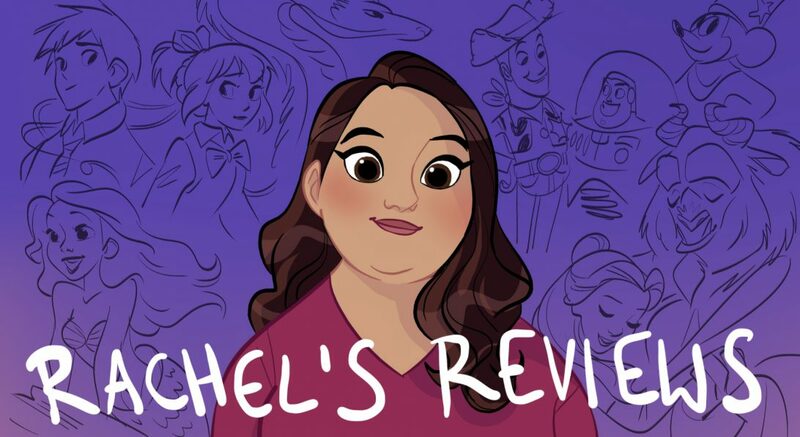 This same year 20th Century Fox released Anastasia which is a million times better than this despite not being perfect. Can’t win them all I guess! But seriously Hollywood get Tim Curry more parts! I quite enjoy the ‘Santa’s Sooty Suit’ song; it’s just enjoyable! You are welcome. I’m glad you enjoyed that song.